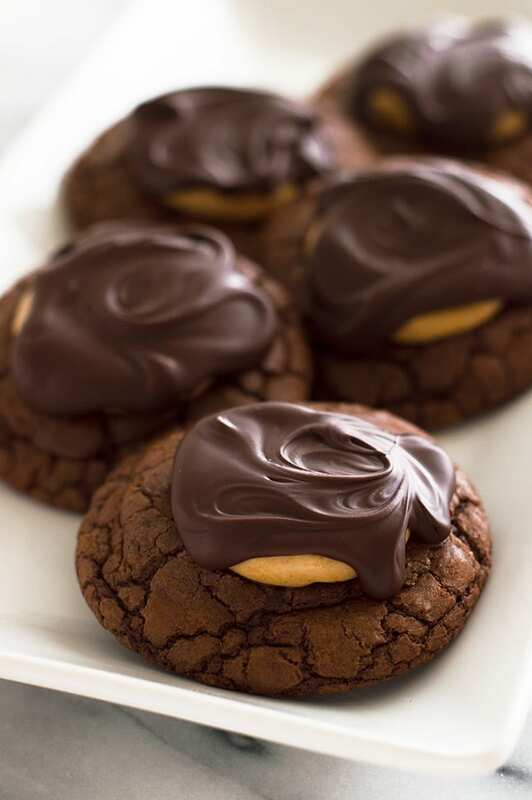 This recipe for six rich and amazing Buckeye Brownie Cookies starts with a fudgy chocolate cookie base, gets a sweet peanut butter center, and is topped with melted chocolate. Another December day, another entry in my small-batch Christmas cookies series (you have checked out the Small-batch Giant Christmas Cookies and Gingerbread Cookies, haven’t you?). Today I’m sharing a batch of cookies that aren’t necessarily solely Christmas cookies, but they are so crazy and rich, that I will happily use the holidays as an excuse to make them: Buckeye Brownie Cookies! 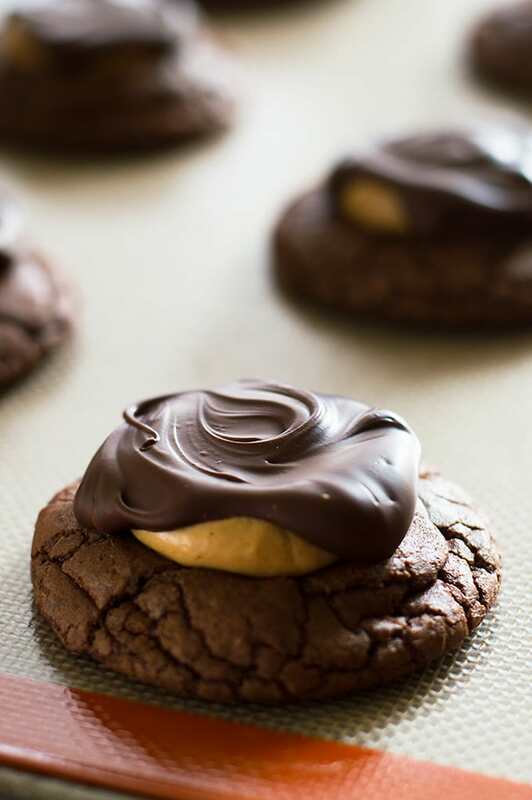 Unfortunately, traditional Buckeyes were not a thing in the circles I grew up in, so the cookie version was my first introduction to the wonderful peanut butter and chocolate world of buckeyes. And what an intro it was. These things are MAGICAL. 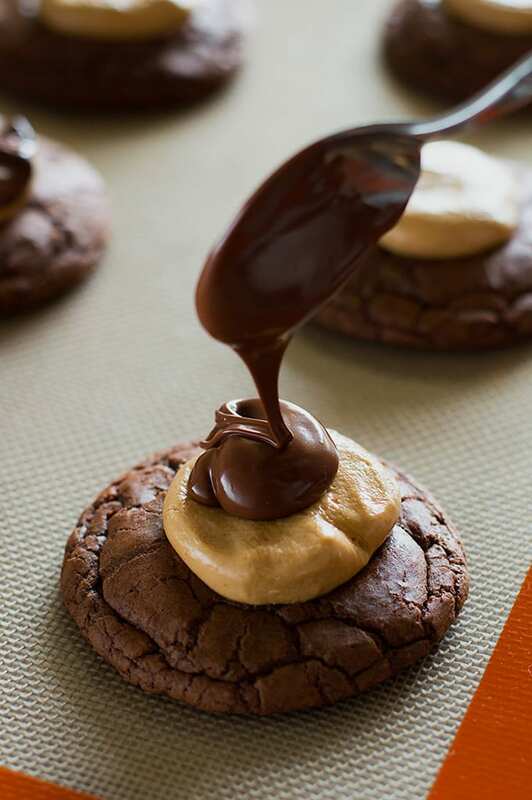 It’s so hard to go wrong with PB and chocolate, but Buckeye Brownie Cookies, with their fudgy chocolate base and sweet peanut butter topping, get things extra right. The cookie base might look familiar. It’s the same one I use for my Miniature Hot Chocolate Cookies. 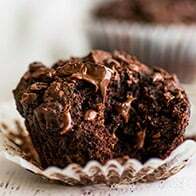 It’s made with pure melted chocolate, with just a tiny bit of cocoa powder, so about 90% of the chocolate flavor comes from actual chocolate, making the cookies incredibly rich and soft, to the point that they are more of a brownie in cookie form than anything. For the melted chocolate in the cookies and on top, you can use chocolate chips, but you will get a smoother finished product and have an easier time melting them with high-quality chips. 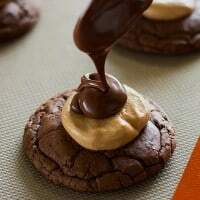 Inversely, expensive old-fashioned/natural peanut butters can be a bit oily for these cookies. You can use it, but the texture of processed brands will give you a smoother peanut butter layer. In a small bowl, melt butter and 2/3 cup of the chocolate chips together in the microwave. Heat for 30 seconds and stir. 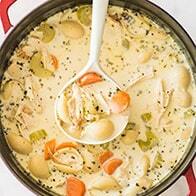 Then continue in 15-second bursts, stirring in between until smooth. Set aside to cool for 5 minutes. In a medium bowl, whisk together brown sugar, egg, and vanilla until just combined. Whisk in the cooled chocolate mixture. Mix in flour, cocoa powder, baking powder, and salt, until just combined. Cover and chill dough for 45 minutes until the dough is firm enough to handle. Preheat oven to 325°Line baking sheet with parchment paper or silicone baking mat. Roll dough into 6 large balls and place on prepared cookie sheet spaced evenly apart. Bake for 10 to 13 minutes until edges of the cookie are crinkled and look set. In a small bowl, use a fork to mix peanut butter and powdered sugar until well-combined. Divide mixture into 6 even balls. 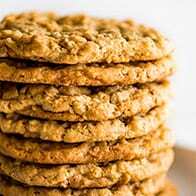 Squish peanut butter into 1/4-inch disks between the palms of your hands and place in the centers of the warm cookies, pressing them down just slightly. In a small bowl, melt chocolate. 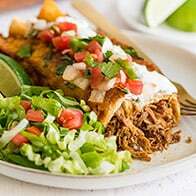 Heat in the microwave for 30 seconds, stir and then microwave for an additional 15 seconds. Repeat until chocolate is melted. Spoon over the cookies and chill until chocolate is set. Serve and enjoy! This is excellent! Only thing I did different was to bake the peanut butter/powder sugar mix with the cookie. Turned out great. 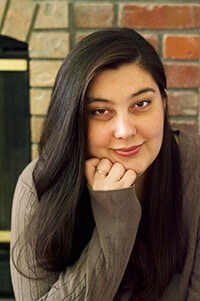 I’m so glad they worked out for you, Shawna! Thanks, Seraphina! So glad you enjoyed them! !